Do you believe in miracles? No, me neither. But sometimes sports gets awfully close to changing my mind. Let me tell you about the Chipolopolo, Zambia’s national football team, which just won the country’s first-ever Africa Cup of Nations tournament on Sunday. Zambia beat Ivory Coast on penalties, 8-7. This was an Ivory Coast side that has been called that nation’s golden generation. It featured a lineup studded with stars who ply their trade in Europe’s biggest leagues, including names such as Didier Drogba and Salomon Kalou of Chelsea, Arsenal’s Gervinho, Newcastle’s Cheick Tiote and Manchester City’s Kolo and Yaya Toure. Zambia didn’t have any big-named players like that. However, after Sunday’s final, you wondered whether something even bigger was possibly on their side. In 1993, Zambia’s national team boarded a flight from Gabon to a World Cup qualifier in Senegal. The plane crashed, killing 30 passengers, including 18 Zambian football players. Nineteen years later, Zambia returned to Gabon for the Africa Cup of Nations final, and they are leaving as continental champions. It was an admittedly cautious game. Despite their wealth of attacking talent, Ivory Coast played fairly conservatively, which suited Zambia just fine. But whatever the match lacked in entertainment value during regular time it more than made up for when the result was decided with penalty kicks. After the first 14 kicks were converted, Ivory Coach manager Francois Zahoui asked Gervinho to take a kick. 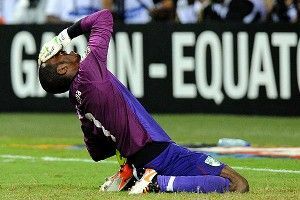 The Arsenal winger refused and Kolo Toure stepped in, only to have his shot saved by Zambia’s keeper, Kennedy Mweene. Chipolopolo defender Stophira Sunzu scored a few attempts later, winning the cup for Zambia. One player who was not on that tragic 1993 flight was Kalusha Bwalya, then the captain of the national team. Widely regarded as Zambia’s greatest-ever footballer, Bwalya was playing for the Dutch side, PSV, at the time, and was making his own way to Senegal. In the aftermath of the crash, he helped rebuild the national side, both as a player and as the current president of their football association. When Sunzu scored the tournament-winning goal the team went to celebrate with Bwalya. Gabon had once been the sight of Zambia’s greatest football tragedies. Now it was hosting its greatest triumph.